John’s Pizzeria and Bakery Alexandra Central Mall is a new pizza joint opened recently at the Alexandra Central Mall. It is located inside a mall part of Park Hotel Alexandra which I visited their Carvery buffet restaurant previously. Geographically, it is sited on the crossroads between Jalan Bukit Merah and Alexandra road. Also, it is located beside landmarks such as Queensway shopping center and Ikea Alexandra. Let’s check it out today. The interior of John’s pizzeria offers a small and cozy setting. 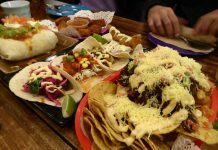 The restaurant is like a typical pizza joint does walk-in takeaways as well as delivery and dine-in. There is some interior seating for single diners as well as groups. 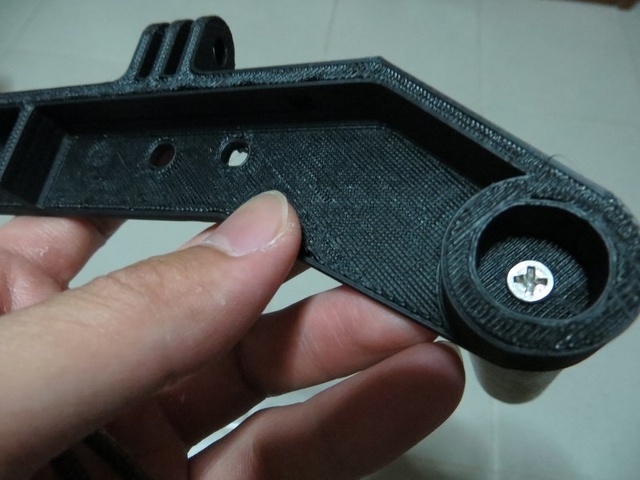 Moreover, there is a small number of tables which can take small groups of 6. The checkout cashier counter of the pizza joint. As the sign says, only cashless payment modes are accepted. Their menu selection is simple. On offer is a selection of 12 inch pizzas, deep dish pizzas as well as desserts pizzas. The restaurant does in addition, the joint serves a small selection of pastries and cookies. They are all laid out at the cashier counter for your choosing. For starters, you have a choice between Stromboli or a Half pizza which feeds up to 2 persons. Moreover, their 12 inch pizzas at under $20 each are thin crusted. You can’t go wrong ordering any of their standard 14 inch pizzas if you want a safe bet. John’s menu selections offering a choice of 14 inch New York style pizzas as well as their signature Deep Dish options. Moreover, you can build your own pizza with a choice of 5 different pizza bases and 15 different toppings ranging from olives, ricotta , ham or sausage. If you prefer something bit more pre-packaged. You can have a selection of 14 different ready choices you can simply order off the menu. 14 inch New York style pizzas with cheese topped over their special New York pizza sauce. On varieties, you get familiar classic choices such as Hawaiian, Supreme, Veggie Supreme ($13.90) or Meat Lovers pizzas. Their 14 inch New York style pizza starts from $23.90 for their basic cheese pizza, with offerings going up to $29.90 for more premium choosing such as Hawaiian, Ricotta Pepperoni Bianca and Supreme (almost like the Pizza hut supreme for reference). There is notably few vegetarian Pizza options. 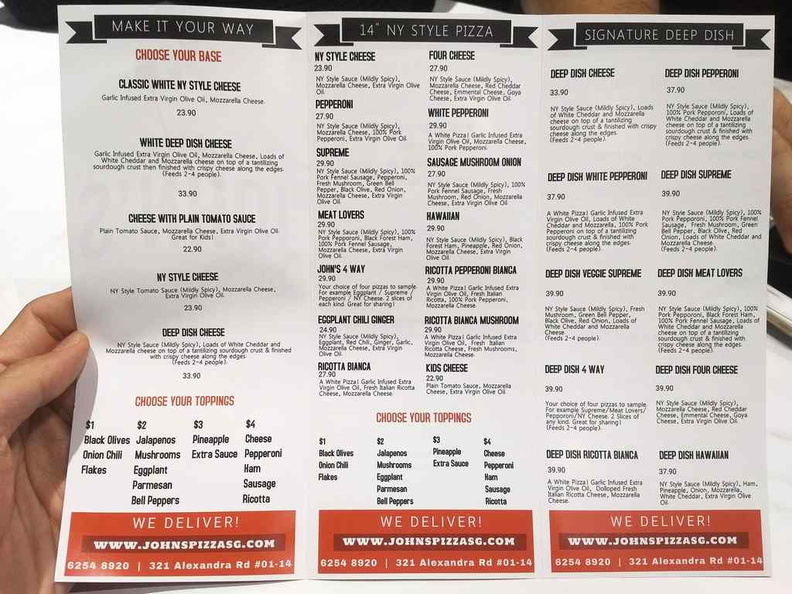 If you are undecided, you could go for the John’s 4 way where you can have 4 different varieties in one pizza at the price of one premium pizza. Furthermore, most of their pizza comes laid with this trademarked New York style sauce. Regardless of your choice of toppings, you get their signature crispiness on their deep dish pizzas. If you are more adventurous and want to try a more unique selection. I will recommend their deep dish pizzas. As the name suggest, the pizzas are baked in a deeper dish pizza. You can relate to it similarly like a lasagna dish. 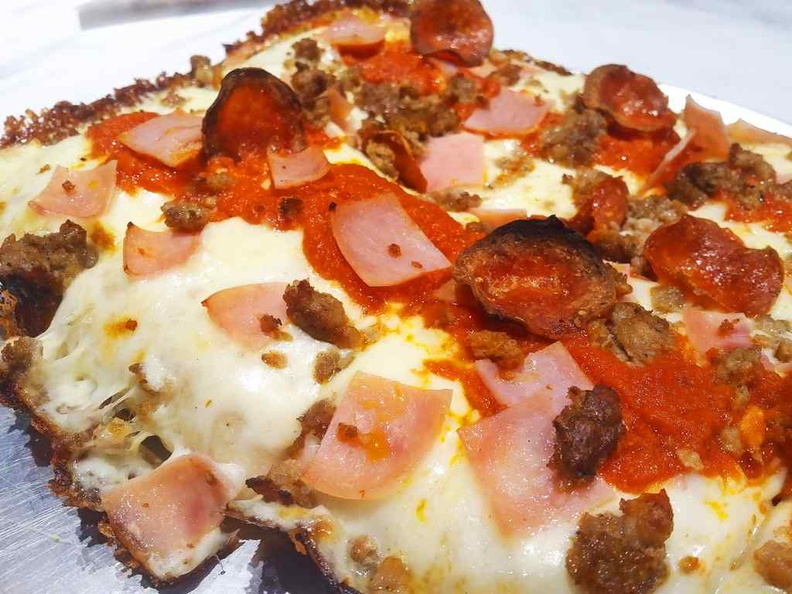 It allows for a much thicker crust and a more filling meal. Moreover, on choices, their deep dish cheese pizza starts at $33.90 with choices up to $39.90 for more premium selection. On average the deep dish versions are about $8 to 10 more expensive than their 14″ pizzas. 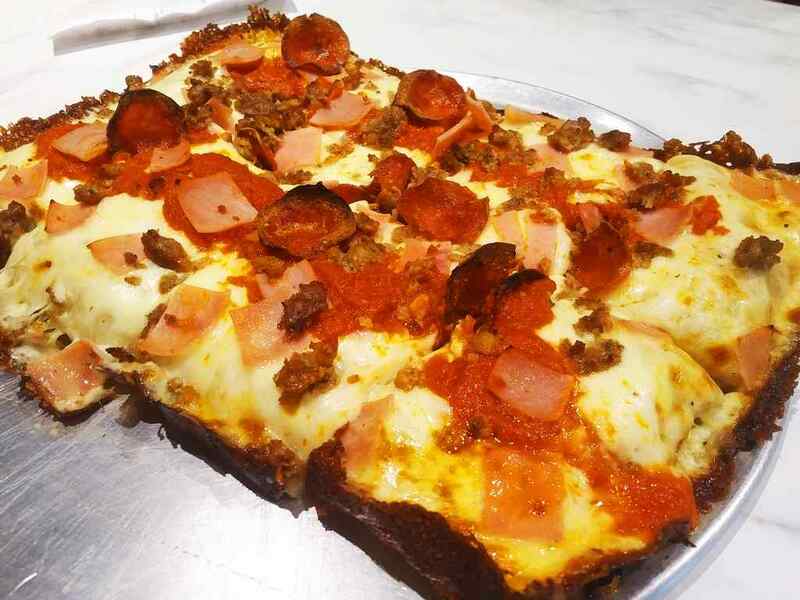 The rectangular meat lovers deep dish pizza. It is not as deep as expected, but makes up for it with taste and an addictively Crispy outer crust. However, their dish deep pizzas are pretty wholesome. The pizza crust is one of the best part of the pizza and each slice get a part of it, with the best being the corner pieces. Their menu claims each deep dish can serve 6 to 8 people. Though realistically, I would say a pizza can only serve 4 with 2 pizza slices per person. There are 8 slices per rectangular pizza. Their pizzas are not overly oily, with a cheesy interior and crispy brown outer crust. It is quite a delight. You can smell the pizzas when they are ready, given the kitchen situated right in the heart of the dining area. The cheese used in the pizza is the real stuff and are really stretchy. However, the pizzas are not stone flame oven cooked but rather made using modern steel ovens. Hence you get less of the burnt edges you find from stone fired pizzas. Not that it I found that to affect the quality of the pizzas much. Some gripes, their deep dish pizzas do not appear as deep as what you expect from a “deep dish”. Also, they are oddly served on a rounded pizza platter board, which does not quite follow with the rectangular pizza. Additionally, to top up your meal offerings is a simple selection of dessert pizzas. Their dessert pizza $14.90 great for sharing, it is a rectangular pizza 12 inch across. It is a good choice to go for after your pizza main. 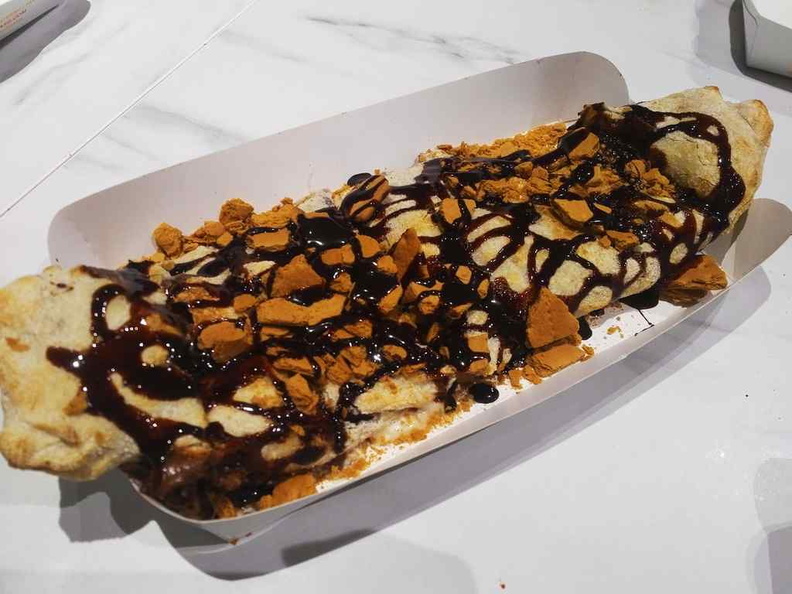 John’s chocolate dessert pizza, it is so sinfully awesome. 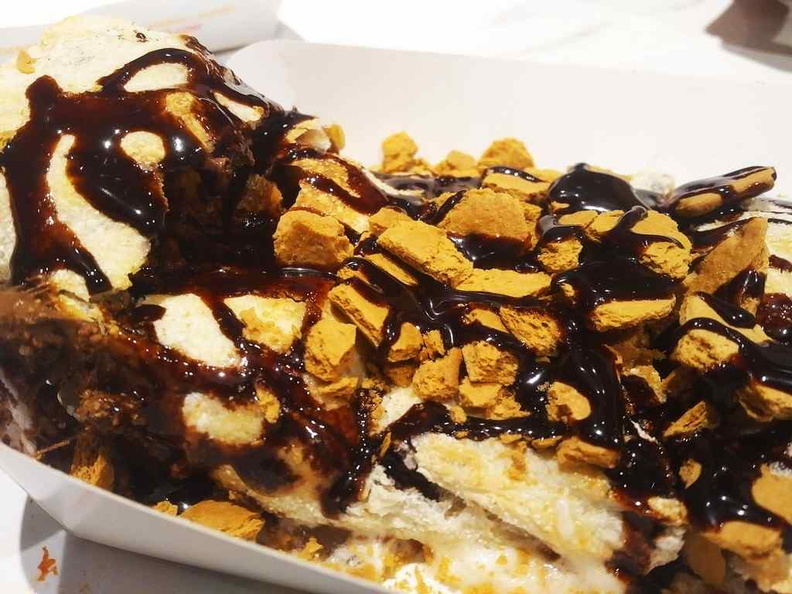 It is filled with melted marshmallows and topped with drizzles of nutella and marshmallows cubes. It is a sinful sweet affair but is otherwise a dessert heaven. Your pizza is similarly oven-baked. Close up of the 12 inch dessert pizza. Look at the mountain of chocolate and marshmallows. Food is generally affordable. A typical sharing meal with 2 pizzas will set you back about $20 per head for say a group of 4. Moreover, on payment modes, the restaurant is completely cashless. 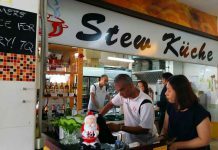 This is one of the few restaurants in Singapore which does not accept cash at the counter, with only card and nets payment options available. Credit cards are also accepted. Moreover, John’s Pizzeria does island-wide delivery, with delivery charges starting at $4 within the neighborhood and $5 for everywhere else in Singapore. There is only one branch so far in Singapore, with the first outlet being this one in Alexandra central mall. All in all, John’s Pizzeria & Bakery is a nice addition to the otherwise quiet Alexandra Central Mall. Their deep pizzas and dessert pizzas gets my recommendations and is great for sharing groups. I reckon next time if I were to be hanging out of shopping in the region, you do know where to get good pizzas on the southern block. 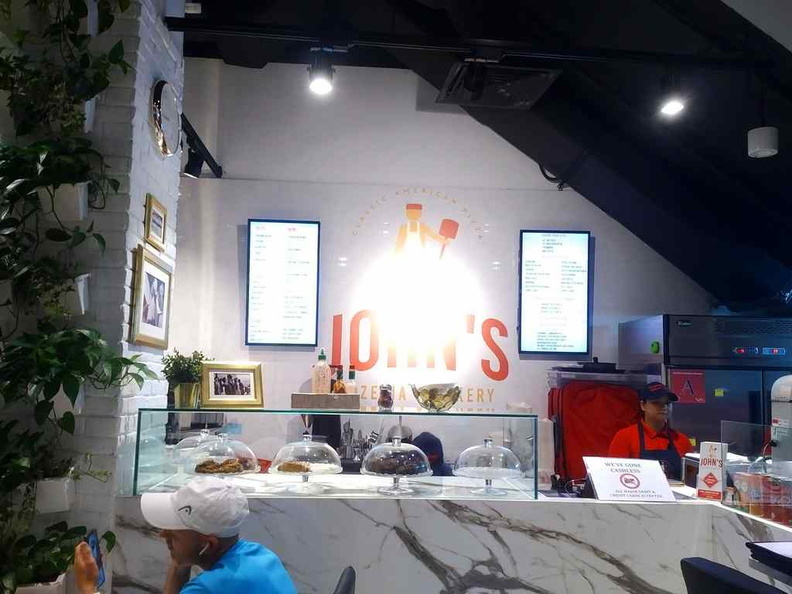 John’s Pizzeria and Bakery at Alexandra Central Mall. Opens daily, but closed on Mondays.